At the age of thirty-five, Romanus retired into the forests of Mount Jura, between France and Switzerland, and fixed his abode at a place called Condate, at the conflux of the rivers Bienne and Aliere, where he found a plot of ground fit for culture, and some trees which furnished him with wild fruit. Here he spent his time in praying, reading, and laboring for his subsistence. Lupicinus, his brother, came to him there, accompanied by several other disciples, who then were followed by still others, drawn by the fame of the virtue and miracles of these two Saints. Other monasteries became necessary. 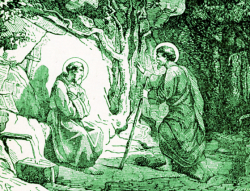 Saint Romanus, when he was 54 years old, was ordained a priest by Saint Hilary, Bishop of Poitiers; he remained simple in his conduct and never sought any privileges among his brethren. As their numbers increased, the brothers built several monasteries as well as a convent for their sister and other women, called La Baume; before Saint Romanus died, there were already five hundred nuns cloistered there in prayer and sacrifice. They kept strict silence, and like their brothers, sons or relatives in the nearby monastery of Lauconne, considered themselves as persons dead to the present life. The two brothers governed the monks jointly and in great harmony, though they were of different dispositions; the gentleness of the first was balanced by the severity of the other, according to need. When a group of rebellious monks departed, Saint Romanus, by his patience and prayer, won them back, and if they departed a second or even a third time, received them with the same kindness. When Lupicinus, whose habits were very mortified, reproached him for his leniency, he replied that God alone knew the depths of hearts, and that among those who never departed, there were some whose fervor had declined, whereas some of those who returned after leaving even three times, were serving God in exemplary piety; and finally, that among the brethren who remained outside the monastery, certain ones had religiously practiced the maxims they had learned in the monastery, even becoming priests and authorities for other religious functions or offices. Saint Romanus died about the year 460, and Saint Lupicinus survived him for twenty years. *On leap years, the feast day of these Saints is celebrated on February 29.